Programmers like to place TODO markers in their code which serves as a reminder for tasks that need to be completed. 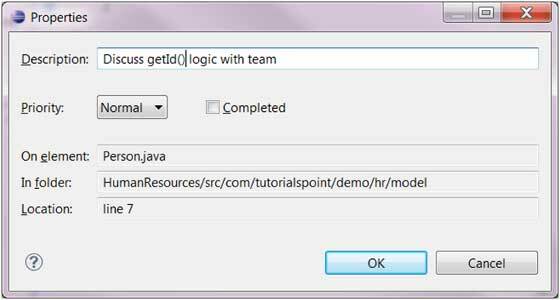 Comments in the Java code that has the word TODO in them are recognized as task and shown on the marker bar and in the Tasks view. An eclipse editor can be used to associate tasks with the file being edited by right clicking on the marker bar and selecting Add Task. In the dialog box that comes up enter the task description and select a priority from the priority drop down list and then click on the OK button. 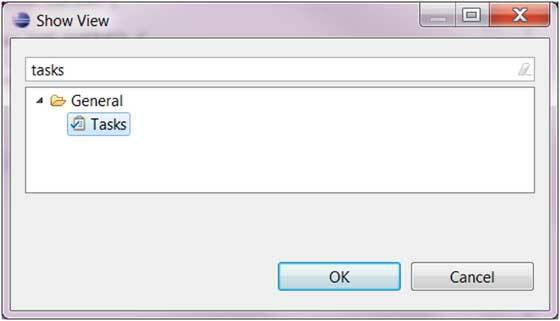 To remove a task using an Eclipse editor, right-click on the task icon in the marker bar and select the Remove Task menu item. Click on the Window menu and select Show View → Other. In the filter text box enter Tasks. The Tasks view can be used to view all the tasks and add tasks not associated with any resource. Change the priority associated with a task. Mark a task as completed. Remove a task or all completed tasks.